Lucky for us Houstonians, finding a studio or gym to meet your fitness needs is easy: There’s no shortage of options, with workouts ranging from pole dancing to CrossFit, on every corner and in every part of town. There is one concept, though, that’s unlike anything I’ve ever tried in the area. Sure, there are similarities to other facilities that focus on interval training, but a class at SWEAT 1000 takes you to the next level, both mentally and physically. Run by husband-and-wife team, Jordan and Ana Strouse, the pair operate the Heights studio, SWEAT 1000′s only Houston location—heck, the only location on this continent–that opened this spring. The concept made its way to the U.S. after finding great success in Cape Town and Johannesburg, South Africa, where it serves internationally famous clients including TV stars, professional athletes, and Sports Illustrated models. The name stands for Specialized Weight Endurance Athletic Training, and “1000” represents the number of calories burned during the intense one-hour, full-body workout. Having done the class, I can attest that I burned all the calories my body was willing to shed in 60 minutes. The workout (which is different every single time) is fast, combining treadmills, weights, and mat exercises with little to no rest in-between for maximum results. SWEAT 1000 welcomes all fitness levels, but regardless of where you stand, you will work and you will sweat—a lot. The studio itself is immaculate–think large locker rooms with showers and stainless, white, and custom-built maple lockers; state-of-the-art FreeMotion Incline treadmills; and well-maintained dumbbells and mats. The space was designed by California-based Melissa Mohr Brown of the Cearnal Collective, who’s well-versed in envisioning LEED-efficient buildings and athletic complexes. 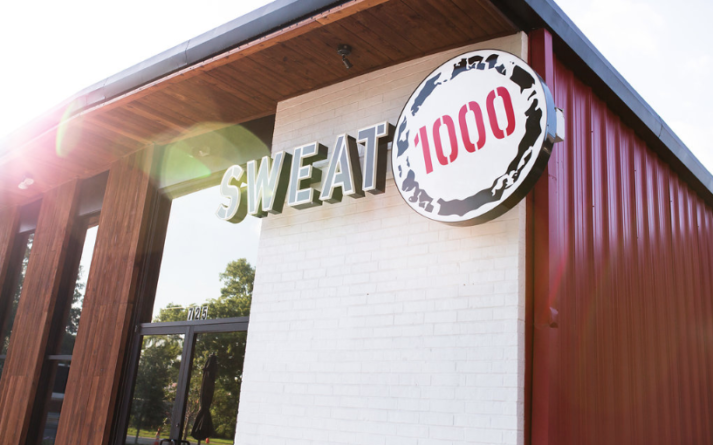 If you’re someone looking for a challenging workout that guarantees results, SWEAT 1000 might just be your spot. The staff and trainers are friendly, welcoming, and encouraging, and the studio is already fostering a great sense of community—you even can pre-order a protein shake to have ready and waiting for you post-sweat sesh. Feel up to the challenge? Your first class is always free.